â€œThey torment me. I wake in the night and the trail of their feet whispers in my brain. I have no peace. For they are in me.â€Â Irena Dubrovna apparently has an icky feeling inside? Join Chad Hunt, Joseph Perry, and Jeff Mohr, along with guest host Whitney Modesta Collazo as they come on little cat feet and sit looking overÂ Cat PeopleÂ on silent haunches. Wait. Does that sound familiar? Anyway, listen to the Grue Crew scratch below the surface of this unmitigated classic! 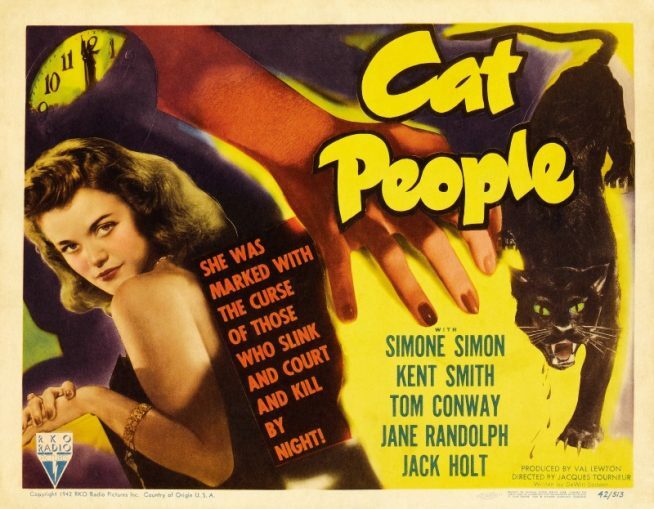 Cat PeopleÂ is the first film inÂ RKOâ€™sÂ plan to release low budget horror films intended to compete with Universalâ€™s output. The studio handed their new effort to first time producerÂ Val Lewton, who had been recommended by David O. Selznick. 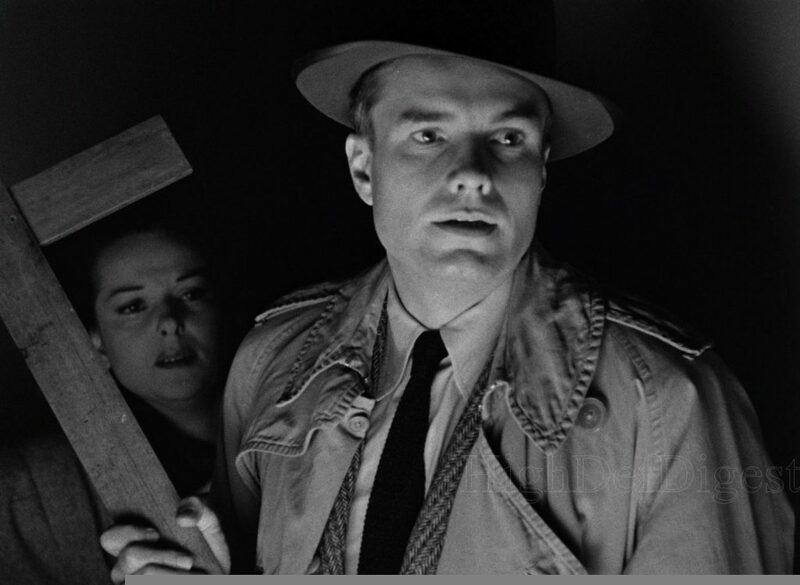 Lewton enlisted first time screenwriterÂ DeWitt BodeanÂ to write the script and then surrounded himself with an excellent crew led by directorÂ Jacques TourneurÂ and cinematographerÂ Nicholas Musuraca. Cast as Irena Dubrovna, the filmâ€™s central character,Â Simone Simonâ€™sÂ mysterious and exotic look was key to the success ofÂ Cat People.Â Kent SmithÂ took the role of her soon-to-be husband, Oliver Reed, withÂ Jane Randolphrounding out the love triangle as Alice Moore, ostensibly Reedâ€™s work colleague. The four main characters are rounded out byÂ Tom ConwayÂ as Dr. Judd, a psychiatrist brought in to treat Irenaâ€™s obsession with the legend of her familyâ€™s curse and her accompnaying fears of intimacy. 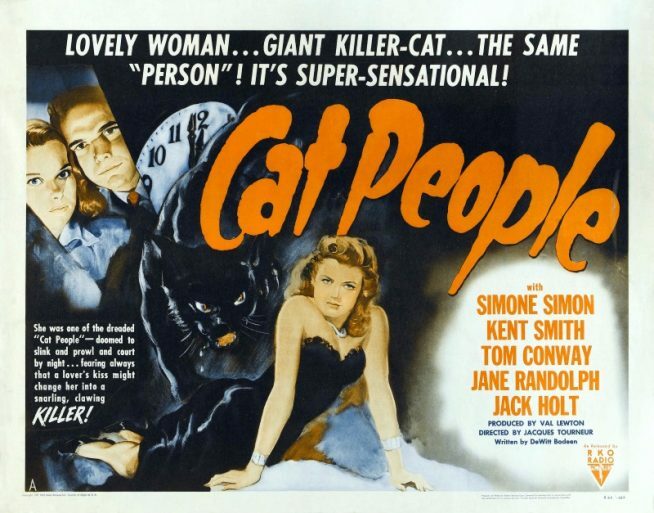 An able supporting cast, led byÂ Alan NapierÂ as another of Reedâ€™s work colleagues andÂ Jack HoltÂ as Reedâ€™s boss, make solid contributions to the feel and atmosphere ofÂ Cat People. This episodeâ€™s Grue Crew all marvel at Tourneurâ€™s and Musuracaâ€™s use of shadows and fog to foster the eerie atmosphere present throughoutÂ Cat PeopleÂ and how truly terrifying the film is despite most of the action being hidden in shadows and not explicitly shown. Whitney is impressed by the stress and vulnerability she felt during the swimming pool scene and points out the impact the set design has on creating the filmâ€™s mood. Chad emphasizes the sophistication of the film, its tight script, and the existence of the storytelling technique known as the â€œLewton Bus.â€ He also points out three â€“ count â€˜em, three â€“ more connections to the Batman TV series. We learn of Josephâ€™s unrequited love for Jane Randolph (Abbott and Costello Meet Frankenstein, 1948). 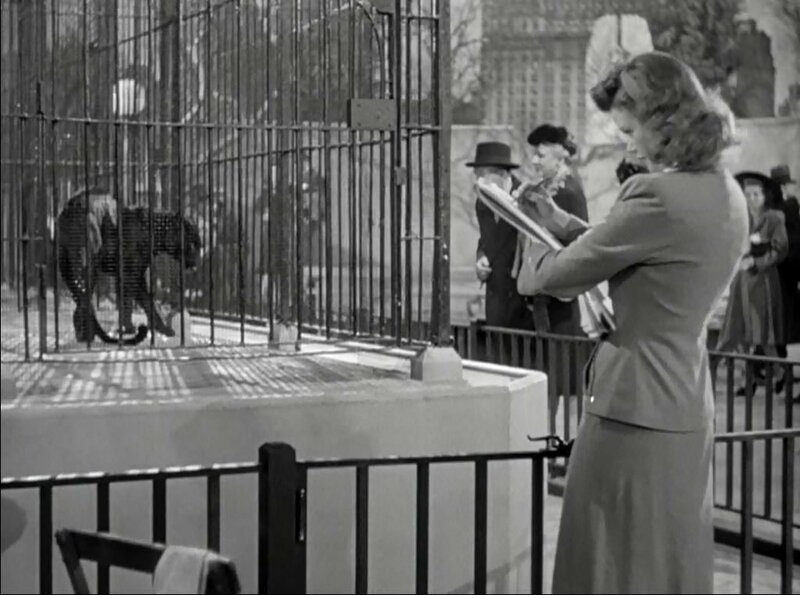 Jeff and Joseph remark on some of the similarities thatÂ Cat PeopleÂ has withÂ film noirÂ and Jeff gets lost in the supporting cast. Of course he did. 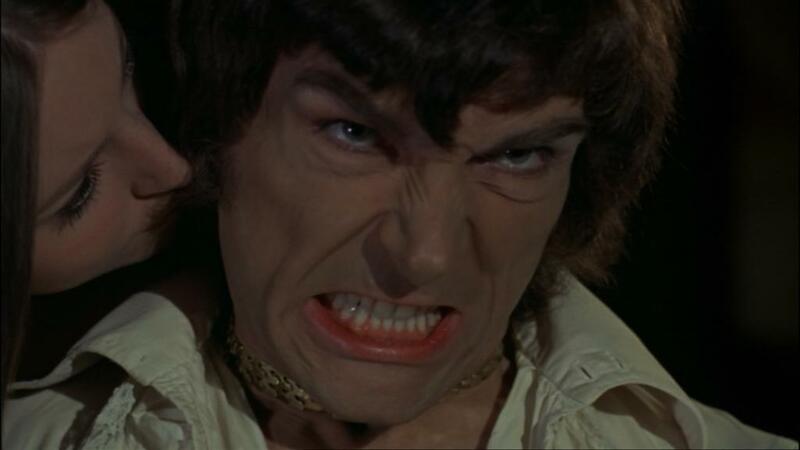 Needless to say, they all pronounceÂ Cat PeopleÂ to be a must see film! We plan to release a new episode every other week. On the next episode in ourÂ veryÂ flexible schedule, we â€˜ll be coveringÂ Die, Monster, Die!Â (1965), the film that tied for first place in our latest Patreon Poll. Please let us know what you think of Decades of Horror: The Classic Era and what films youâ€™d like to hear us cover! We want to hear from you! After all, without you, weâ€™re just four nutjobs talking about the films we love. Send us an email or leave us a message, a review, or a comment at GruesomeMagazine.com, iTunes, Stitcher, Google Play, or the Horror News Radio Facebook group.